Reverend Matthew J. Crosson (1908-1986) was born in Greenwich Village. He moved to Woodside, Queens, in 1926, when he was eighteen years old, and was ordained a priest in 1934. He began working in the Bronx soon thereafter. From 1941 to 1946, Crosson served as an army chaplain in the South Pacific, where he won several citations for bravery and devotion. After World War II, Crosson returned to the United States and held several pastorates throughout the New York City area. His last assignment, from 1964 until his death in 1968, was as the pastor of St. Patrick’s Church in Highland Mills, New York. People all over New York referred to him affectionately as “the baseball priest” because of his long-standing association with youth athletic leagues. In December 1936, the Regional Plan Association recommended the construction of a link between the Gowanus Parkway and the Triborough Bridge. What was then called the Brooklyn-Queens Connecting Highway was to be financed equally by federal, state, and city funds. The construction of the Kosciuszko Bridge over Newtown Creek in 1939 was the first piece of what would later become the Brooklyn-Queens Expressway, or the B.Q.E. The route of today’s B.Q.E. was devised by Parks Commissioner Robert Moses (1888-1981) in late 1945, and the expressway was constructed in the 1950s and 1960s. On November 17, 1955, the City of New York acquired this Woodside land in order to widen the Brooklyn-Queens Expressway. Jurisdiction over the land was conveyed to Parks later that day. 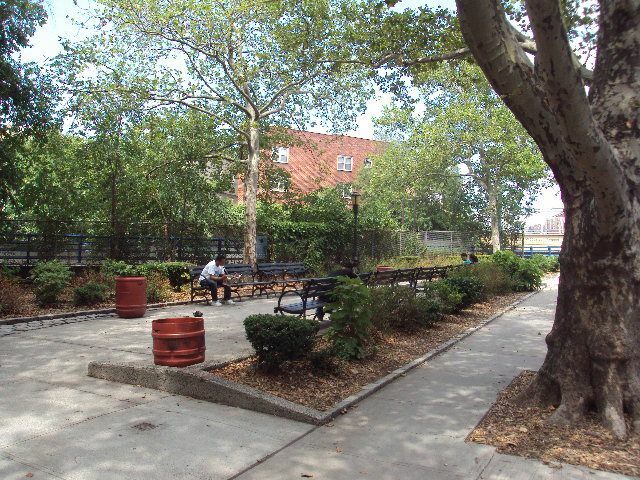 Renovations to the land included modifications of the lines and grades of the street system and the laying out of six “sitting parks.” The parks were named on June 18, 1987. Two were called Crosson Green and Crosson Park. The other four (Jennings Park, Latham Park, Sherry Park, and Spargo Park) were named for Robert Moses’s most prominent aides, in tribute to their many years of dedicated service to Parks and New York City. In 1999, Council Member John D. Sabini sponsored a $40,000 installation of new pavements at Crosson Green, and today the park is characterized by wooden benches, a water fountain, lampposts, trees, and other greenery.